A few months ago, I built a bench from a tutorial on Dear Lillie. 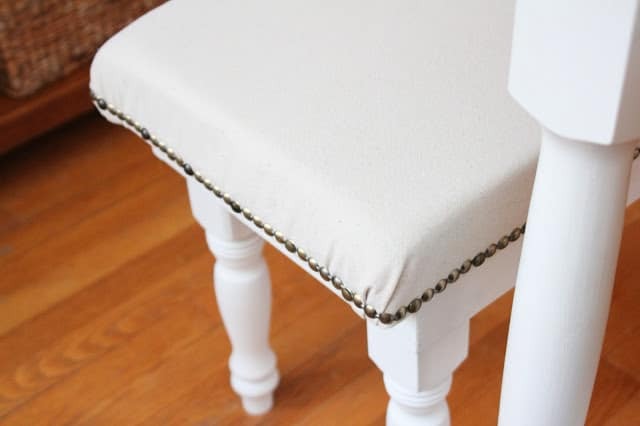 I figured I might eventually change the color and the fabric depending on what kind of table we got, so I initially just gave it a quick coat of white paint, covered it with a drop cloth and added leftover nailhead trim from my upholstered headboard project. It’s a really easy bench to build yourself, and I highly recommend it if you need extra seating for the holidays. 1 | After using the bench daily for a few months, I felt it needed more support for my older kids and for adults, so last week, before changing it’s color to match the new table, I added 2 more legs to the center. 2 | I had to rework the support brackets underneath the seat to add two more legs, and was left with a lot of screw holes. Even after I filled them with wood putty, they were still evident, so I trimmed out the bench with a little acanthus leaf molding. Now the bench works perfectly for my family and it’s super comfy! 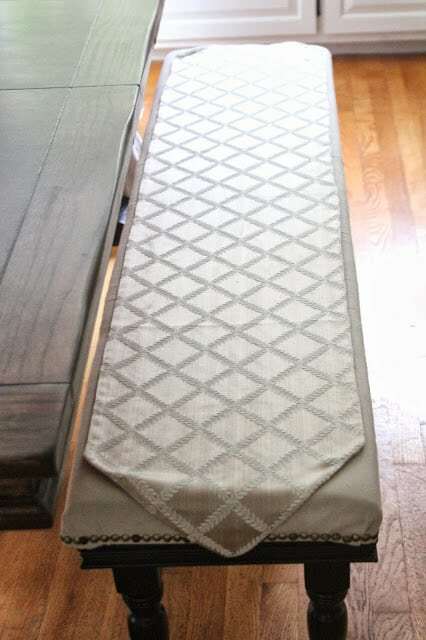 but I discovered that a few of my table runners are the perfect length to act as slipcovers of sorts. This worked fine when we had company for dinner this past weekend. 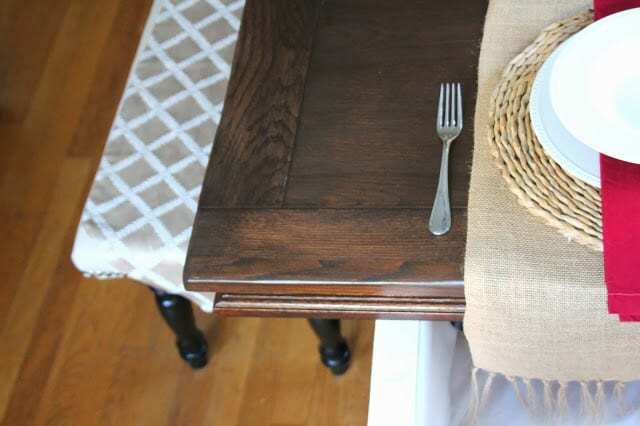 I really love this grain sack slipcover (and this dining room in general!) at Willow Decor. 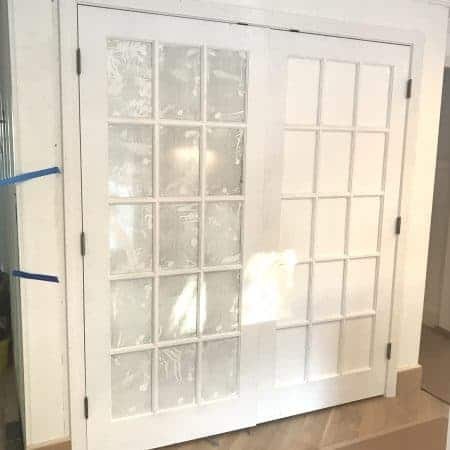 When we finally replace our chairs (that have been reglued and repainted countless times, and don’t have a lot of life left in them) I will likely put the bench to the side of the dining room and pull it to the table when we have company. It’s perfect for squishing a bunch of kiddos and/or adults in, and isn’t that what makes big family dinners so much fun? — everyone all squished in together at one big table, talking, laughing, passing dishes, making memories?? But what kind of mother would I be if I didn’t give my kids memories like this to discuss when they grow up? It’s my job. 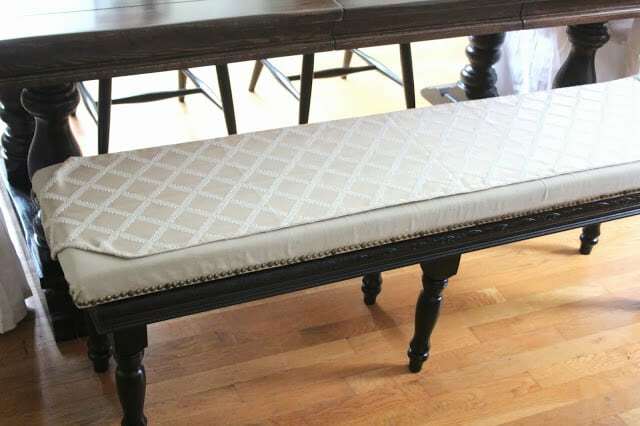 If you’re looking to build your own bench, check out the tutorial at Dear Lillie here. Perfect with your new gorgeous table Lisa! 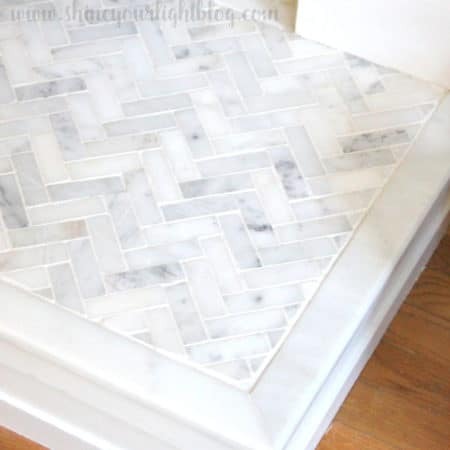 I built a built-in bench this weekend for the dormer, but I love the beautiful legs on yours, the runner is terrific idea as well. 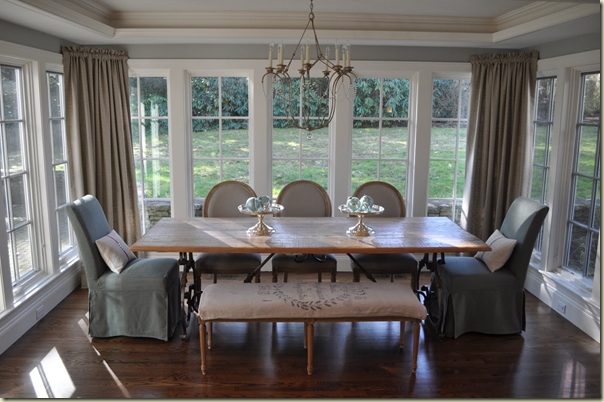 I sometimes use them too to back my tall dining chairs to change the look. Great job dear! I love a quick fix like that! 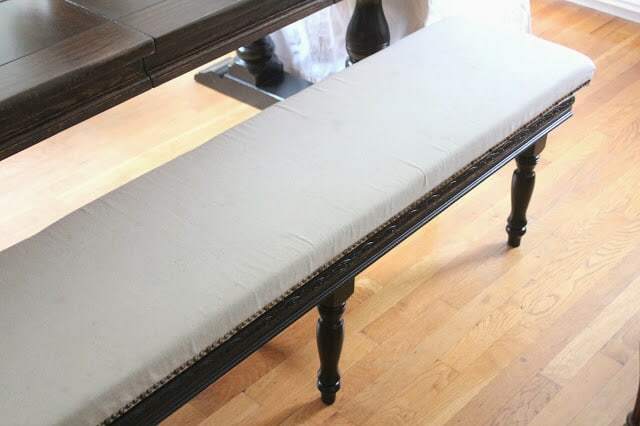 I actually have a bench cover that has seen too many days of cheetos hands and pizza spills….might have to hunt down a runner this week! What a smart idea. I love your bench. You do good work my friend! What a great idea to use a runner for a clean presentation. My memories of the 'bench and kids table' are fond ones. They will not say that. love it! the legs and details make it! and i love the idea of a grainsack, too- that will look awesome! Wow, I am so impressed, Lisa! 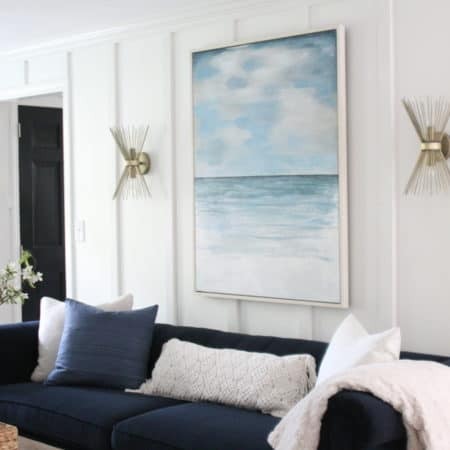 And I LOVE that dining room inspiration photo! 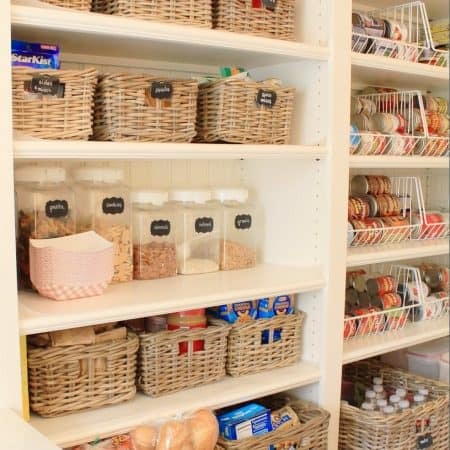 I think I have that same picture in my files in case I ever build my fantasy kitchen/breakfast room! Great job, Lisa! 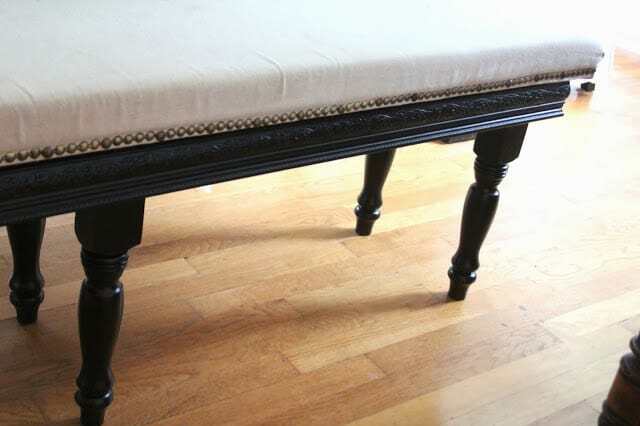 I will be doing a bench makeover for ORC but all I will do is reupholster. 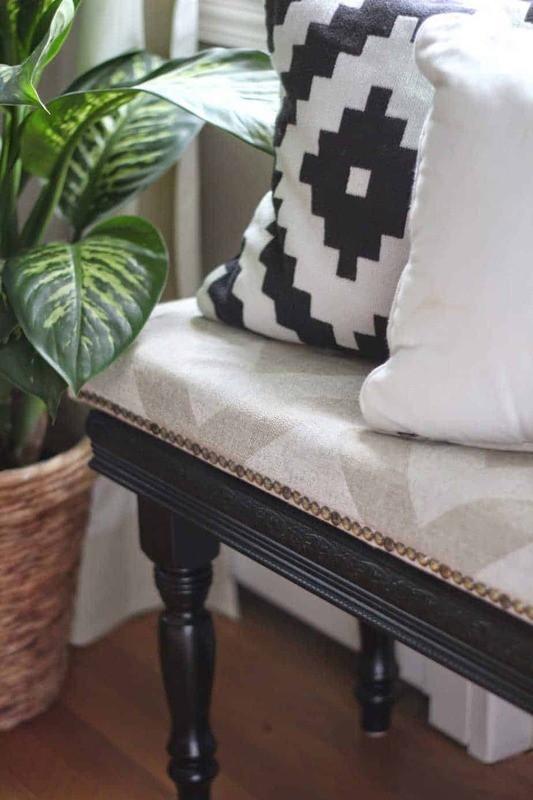 I have no doubt I'll be doing some sort of slipcover on it – I was thinking a kitchen towel, but your runner is way cuter than that! You're so clever and awesome with your power tools, too! 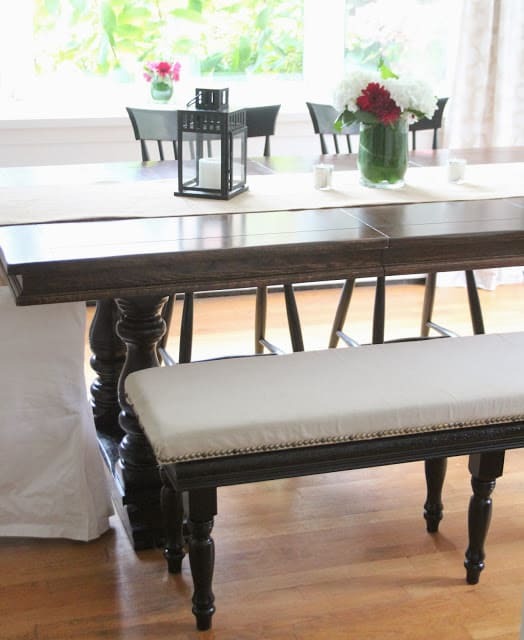 I LOVE the look of a bench at the dining room table, in my very first house I had two benches at a very modern glass and brass table, everyone thought it was a little crazy back then! 🙂 If you can build a bench girl you can thread a bobbin!